NEWS RELEASE ST. 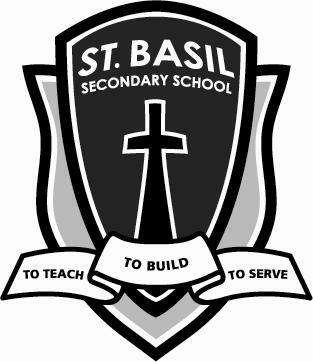 BASIL SECONDARY ************************* Do you want to preserve the environment, save money and help out worthwhile causes? St. Basil Catholic Secondary School can help you do all of these things and more. Do you want to preserve the environment, save money and help out worthwhile causes? St. Basil Catholic Secondary School can help you do all of these things and more. The Grade 10 Religion students at St. Basil are now accepting pre-sale orders as part of their truckload Rain Barrel sale. The students decided on two worthwhile causes who will benefit from the sale. Half of the proceeds will support Ryan’s Well Foundation, an organization dedicated to delivering water access in developing countries, and half will go to the SBSS ROCKS fund, which supports local charities and school initiatives. “Two years ago we held a similar sale and it was such a success and so well received by the community that we wanted to sell them again,” said Religion Teacher, Sarah Alton. It’s easy to take water for granted in Sault Ste. Marie because the city is surrounded by so much fresh water but recently the “brown water” situation has raised interest in water quality issues. Water costs continue to increase, making water conservation not only environmentally friendly, but also easier on the pocketbook. Collected water can also be used to wash cars, clean floors, and even do laundry. They make a great addition to camp, too! These many uses can provide cost savings to every resident, especially those who pay to have water trucked in, use a well, or have a water meter installed. Rain barrels can also provide water conservation opportunities, particularly during the dry summer months, and help divert water from falling close to a home’s foundation. Each barrel is equipped with all the parts needed to put it together, so it can be collecting water in no time at all. The distribution phase of this fundraising event is scheduled for Thursday, June 12 in the Rotunda of the school, 250 St. George’s Avenue, Sault Ste. Marie from 4 p.m. until 8:30 p.m. Rain barrels start at $60 each – much less than what they usually sell for. Orders must be placed in advance before June 5, either online at www.RainBarrel.ca/stbasilss or by calling Mrs. Sarah Alton at the school at 705-945-5542.